29th of February is the rest day for everyone. I don’t need to wake up such early in the morning for the schedule. To find out that I got bruises on my left arm where the blood was taken from me for the HIV examination and such, I was asked by the kind nurse to close my palm, ignorantly I closed it so firmly and I think that's the reason why I got all the bruises, a very big bruise. My right shoulder is in pain as well due to the vaccine that was shot on me, and it got bruised too and itchy and painful. 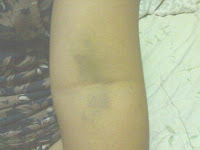 Good thing that when I got my embassy appointment, the bruise on my left arm was gone. Surely they're gonna asked questions about what happened to me just like the repeated questions that was been asked to me at home. 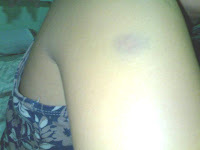 black and blue spot nako during my first vaccination dinhe I think tungod to sa sige litik sa nurse pinangita sa akong vein. nabun og ang spot. then kuha dayon blood. Siguro pud di niya makita imong veins.. sos ako, first time ever ni my life nga nagka bruise in vaccination, naanad na man kog sige turukay since i was a kid kay lagi masakiton ta... pero this just happen to me lately, since Thank to God, i wasn't been hospitalized for YEARS And YEARS now... siguro nanibago lang siya... hahahaha... but it took me weeks before getting rid of those bruises.